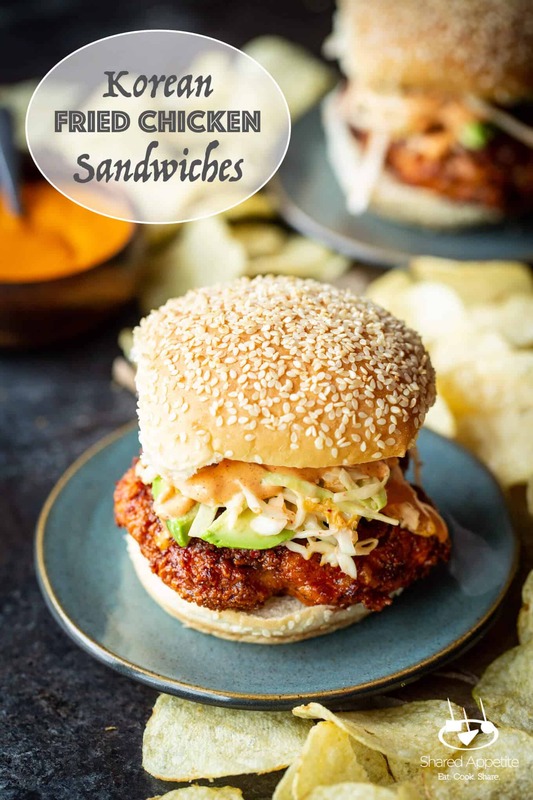 This recipe for Korean Fried Chicken Sandwiches was created in partnership with Martin’s® Potato Rolls and Bread. As always, all opinions and recipes are my own. Thanks for supporting the brands that support Shared Appetite! Ah, June. Quite possibly my favorite month of the year. The weather is pretty much pure perfection. The sun is out for almost 15 hours a day at this point and it’s not too hot, not too cold. Flowers are starting to bud. The pool is open and ready for summer. As a music teacher, although June is one of my busiest and most hectic (hello concert season), it’s also extremely close to summer vacation. I repeat, it’s almost SUMMER VACATION. Two months of no alarm clocks (I still have a 3 year old toddler though waking me up at 6am) and no work clothes (hello elastic mesh shorts). This June specifically will be one I will never forget. Our second child is due to arrive in just a couple of weeks. In fact, even as I type this my wife, sitting next to me eating ice cream and watching The Matrix, is trying to determine if the contractions she’s feeling are Braxton Hicks or true labor. Fun times. The day after Father’s Day. That’s when our baby boy Bennett is scheduled to arrive into this world. I can’t wait to meet him. I can’t wait for Olivia to be a big sister. I can’t wait until I can get sushi again and crack open some of these bottles of wine I’ve been collecting over the past 9 months (eating sushi and drinking wine alone isn’t my jam… I’m waiting for Asheley #gentleman). But let’s back up a second. Father’s Day. I’m always a big advocate for celebrating at home on Father’s Day. Restaurants are always stupid busy, the menus are limited, and the service is hurried. Enough of our life already involves hurried busyness, so a nice relaxing day at home is exactly what I crave come Father’s Day. This year, that’s going to be especially true. It’ll be the last day as a family of 3, and I want to soak up every moment before our lives change in a BIG way. Usually on Father’s Day I’ll fire up the grill (remember those Whiskey Glazed Burgers from last Father’s Day?! ), but this year I’m really excited for these Korean Fried Chicken Sandwiches with Kimchi Slaw and Gochujang Aioli on Martin’s Big Marty’s Rolls! If you’ve been hanging around with me for awhile here on Shared Appetite, you know I’ve got a love for big, bold flavors. These Korean Fried Chicken Sandwiches deliver HUGE in the flavor department. And they are way easier to pull off than you think. No need for a deep fryer or anything like that! It all starts with giving your chicken a nice little rest in a buttermilk-based bath. Actually, scratch that. It actually starts with making sure your chicken is uniform thickness. This will make sure it cooks evenly without some parts being under/over cooked. I just place each chicken breast in-between some plastic wrap and give it a few smacks with a small skillet. When you’re ready to get cooking, I simply dredge each piece of chicken in a mixture of all-purpose flour, cornstarch, and finely-ground cornmeal. It provides a really nice crispy texture that still manages to be light and airy at the same time. And that golden brown color… oh heck yes. But here’s the important part. Don’t just dredge your chicken and throw it into the hot oil. Let it rest on a baking sheet for about 10 minutes. That apparently helps the flour to hydrate a little and also makes sure you’re not throwing really cold chicken into hot oil (which would then drastically lower the temperature of your oil). Once that chicken is golden brown, give it another rest on a baking sheet (a different one from before, of course). Once it’s cooled slightly, you’ll want to give it a BIG smear with this Korean chili paste. Get it in every nook and cranny. It’s AMAZING. You might think at first glance that it’s going to be ridiculously spicy with the amount of gochugaru (Korean chili flakes) it calls for, but the brown sugar in the paste really helps tame the heat and gives it a nicely balanced kick of sweet heat. Don’t make the chili paste last minute. It’s best to whip that together right after you put the chicken in the buttermilk mixture so that the flavors in the paste have time to meld and get to know each other. 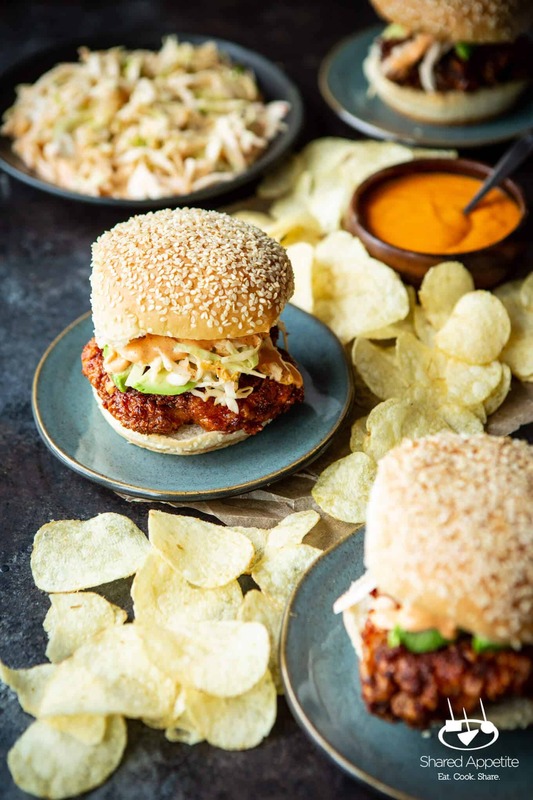 The last components in these Korean Fried Chicken Sandwiches are the Gochujang Aioli and Kimchi Slaw. Gochujang is the Korean equivalent to Sriracha. 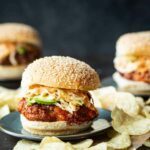 It’s got a great depth of flavor and makes for one heck of an aioli for these Korean Fried Chicken Sandwiches! 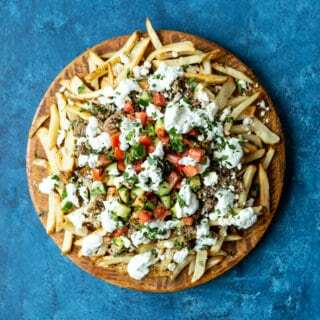 Psst, it’s perfect for Korean Steak Nachos as well! If you’ve never experienced kimchi before, this is a GREAT way to get introduced to the Korean side dish staple. Not going to lie, like all fermented foods… it’s got an intense flavor. 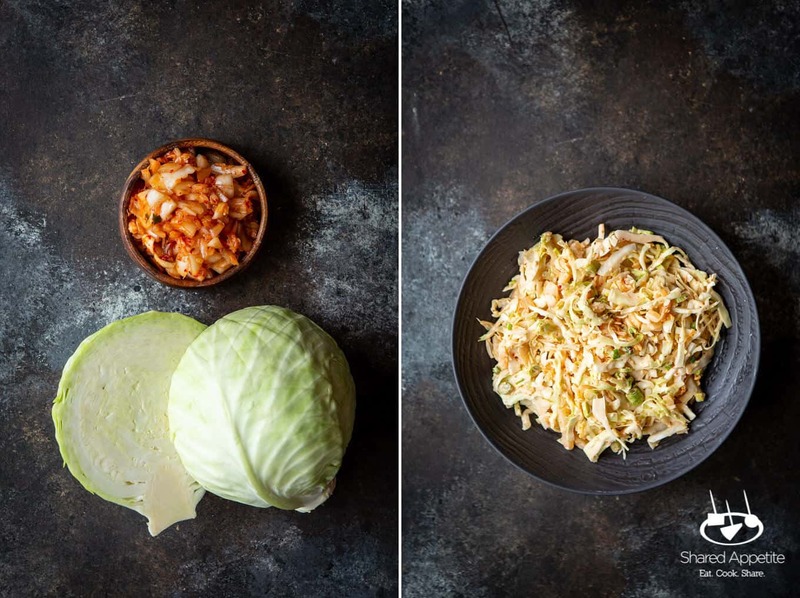 If you’re a kimchi newbie, adding it to slaw is a great way to get some kimchi essence without being slapped in the face with fermented cabbage. Like anyone that loves sandwiches or burgers will tell you… a sandwich or burger is only as good as what it’s served on. Anytime I go to the food store, there’s one and one roll only I reach for every single time: Martin’s Big Marty’s Rolls! 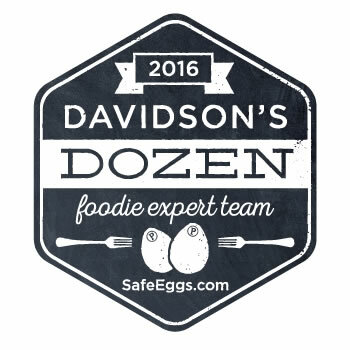 They are, without a doubt, the quintessential roll for all your sandwich and burger needs. 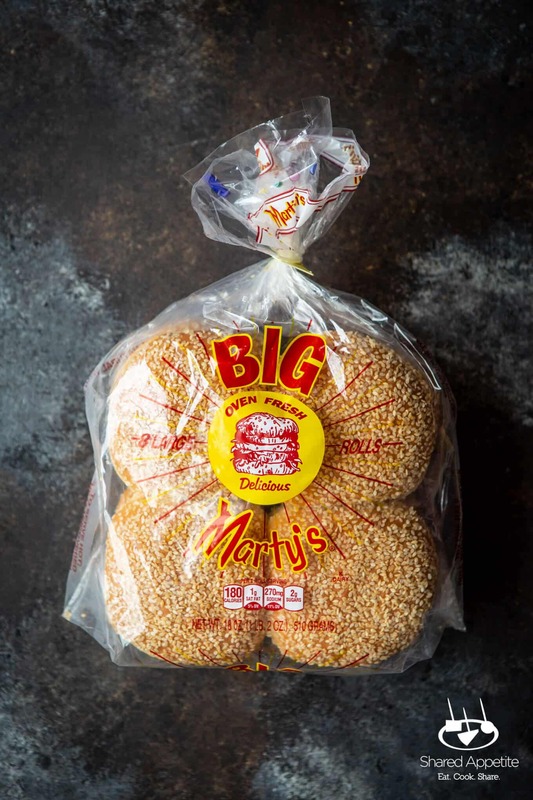 Martin’s Big Marty’s rolls are the perfect size, are incredibly soft and fluffy while being hearty enough for the sauciest of fillings, and stay fresh for an impressively long time. More than any other brand I’ve ever tried, Martin’s Potato Rolls deliver on taste, texture, and freshness EVERY TIME. What more could you ask for in a bun?! And that, my friends, is why you’ll only see me serving up Martin’s Rolls at every backyard get together all summer long. If you need help finding a store near you that carries these magical rolls, be sure to check out their store locator! Don’t go out on Father’s Day. It’s an overcrowded world out there, especially at restaurants on Father’s Day. Stay home and celebrate instead! 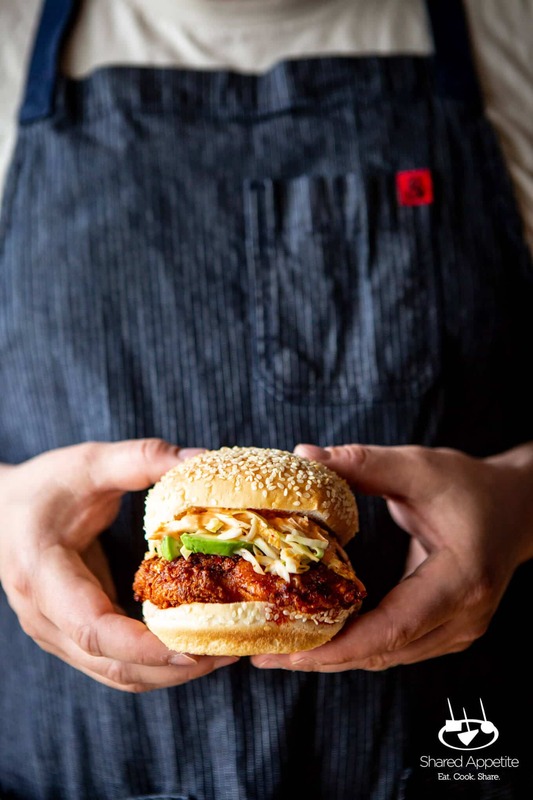 Make these Korean Fried Chicken Sandwiches with Kimchi Slaw and Gochujang Aioli. Don’t forget the Martin’s Big Marty’s Rolls! Happy Father’s Day to all the dads, dads-to-be, grandparents, uncles, and all dudes out there who are father figures in any capacity. 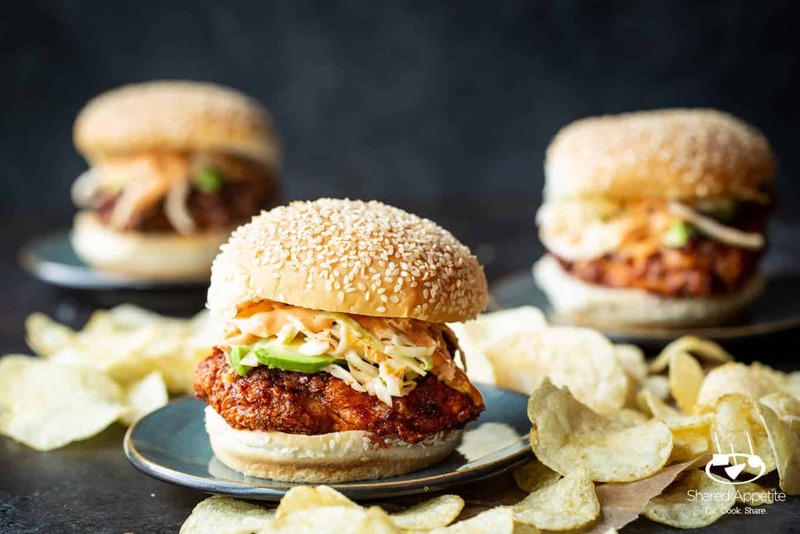 Hope someone in your life treats you to these epic Korean Fried Chicken Sandwiches! And yes, it’s perfectly acceptable to make them for yourself… I know I will be! Place Korean Fried Chicken on each Martin’s Big Marty Roll. Top with avocado, kimchi slaw, and gochujang aioli. Devour! Combine buttermilk, egg, 2 teaspoons of salt, sugar, and garlic powder in a medium bowl or ziploc bag. Add chicken and submerge in buttermilk mixture. Marinate in refrigerator for 2-4 hours. Combine flour, cornstarch, cornmeal, and remaining 1 teaspoon of salt in a bowl or plate. Dredge chicken in flour mixture, making sure each piece of chicken is well coated in the mixture (use your hands to pat the flour mixture onto the surface of the chicken if needed). Let chicken rest on a wire rack for about 10 minutes before frying. Meanwhile, heat oil in a heavy bottom skillet or dutch oven to 330°F. Fry chicken, in batches if necessary (I usually do 2 at a time in my dutch oven), until well browned on each side and chicken is just cooked through. 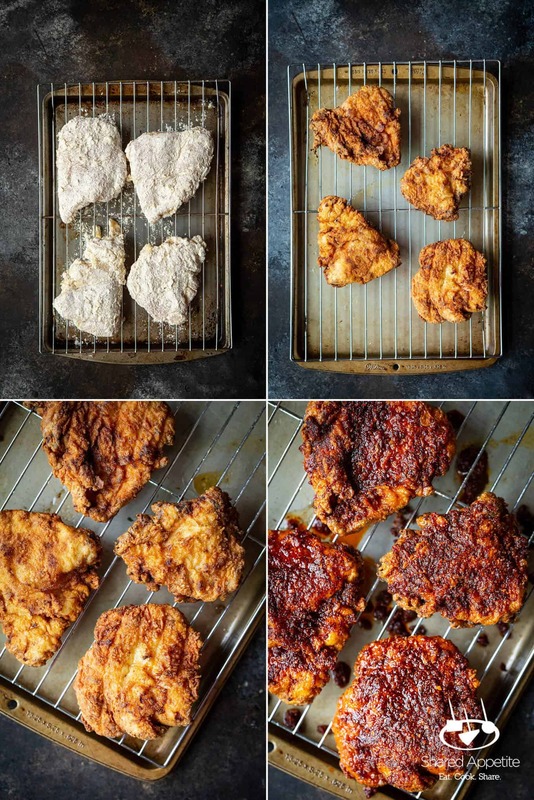 Place fried chicken on another wire rack to cool slightly, then rub Korean Chili Paste all over both sides of fried chicken. Combine all ingredients in a small mixing bowl and allow to rest for at least 60 minutes at room temperature before using. Combine all ingredients in a medium mixing bowl and let rest at least 15 minutes before serving. 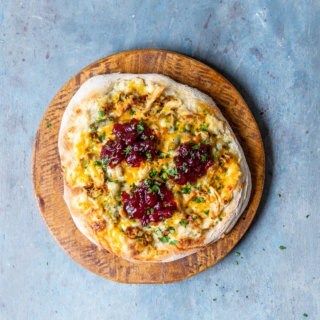 Can be made hours ahead of time and refrigerated. Combine all ingredients in a small bowl and allow flavors to meld for at least 30 minutes before serving. Can be refrigerated for up to a week.